Achilleas Kallakis, the convicted poker player imprisoned for perpetrating a $760 million property fraud, has been ordered to repay just Â£3.25 million ($5.3 million) of his ill-gotten gains. 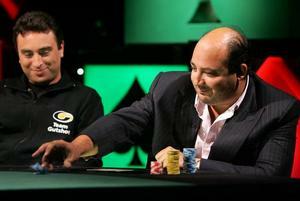 Kallakis, a familiar face on UK poker TV shows in the mid-noughties, was convicted in January 2013 of fraud and jailed for seven years for his part in a scam that defrauded banks of millions. Along with his partner Alexander Williams, a master forger, Kallakis obtained multimillion-pound loans to buy high-value property from the Allied Irish Bank and the Bank of Scotland using forged documents, legal letters and fake guarantees. In all, the duo were found guilty of 21 charges, including conspiracy to defraud, forgery and money laundering. With loans totaling $764 million, the two bought 16 landmark London properties during the housing boom of the mid-noughties, including a government building, the Home Office’s asylum processing center, and even the headquarters of the Daily Telegraph national newspaper on Buckingham Palace Road, which cost Â£225m ($365m). When the scam unraveled, the banks had lost $60 million all told. Kallakis, the nephew of Greek shipping magnate Pantelis “Lou” Kollakis, used the money to fund a champagne lifestyle, including a private jet worth $27 million, a helicopter worth $5.2 million, and a luxury yacht which he kept moored in Monte Carlo. There he rubbed noses with Prince Albert of Monaco and other dignitaries. He also owned a fleet of chauffeur-driven Bentleys, a villa in Mykonos, and a luxurious flat in London’s exclusive Chelsea district. Referring to himself as “His Excellency,” he also claimed to be the Ambassador of San Marino. In his other life as a high-stakes poker player, however, he went by the self-conferred nickname “The Don,” and was invited onto numerous TV shows, such as the partypoker Poker Den and the Pacific Poker Open, where he finished third for Â£100,000 ($1.62m). He was involved in that much-watched hand on YouTube in which he picks up pocket aces in a six-handed turbo sit-n-go against pocket kings and pocket queens, and somehow the kings find a fold before the board runs out 2-3-K-4-Q. In fact, that insane cold-deck took place in 2006, at the height of Kallakis’ crime spree. Despite owing the banks Â£60 million, Kallakis has been ordered to pay back just Â£3.25 million; however, if he does not come up with the goods within six months, his prison sentence will be increased by seven years. Williams, meanwhile, has also been ordered to repay Â£500,000 in six months or receive an additional three-year sentence. Kallakis appealed his initial seven-year sentence, which turned out to be a minus-EV move for the old poker player; on review, the judge determined he’d been dealt with too leniently and bumped his sentence up to 11 years.